Seville; so evocative isn’t it? Just saying the name conjures up images of ancient Moorish archways covered in jasmine; the iconic Giralda bell tower punctuating the clear blue sky; and the smell of the fragrant azahar orange blossom filling the streets. Undoubtedly a welcome antidote to the winter blues. At the end of the day that’s one of the great pleasures of travel – escapism. A time to leave the mundane behind and experience the magic of life; to be captivated by the beauty of a destination; and an early spring break in the Andalusian capital certainly delivers plenty of enchantment. Located in the heart of the historic Santa Cruz district, Hotel Casa 1800 is a palatial mansion house, dating back to the early 19th century. It has a classic Andalusian design with a large central patio running through all three storeys of the property, flooding it with light. Hanging from the centre of the patio roof is a huge chandelier adding a dramatic focal point to the space. The building was rebuilt a few years ago using reclaimed materials, so expect plenty of historic charm, but 21st century comfort. Interior design combines intricately carved doors; ancient pillars; vintage floor tiles; large chandeliers; sumptuous velvet sofas; plenty of exposed brick work. There is access for disabled people, a ground floor guest room and lift to all floors. If your mantra is ‘location, location, location’, then Casa 1800 is the place. It is just a few steps away from some of the best restaurants, tapas bars and flamenco venues as well as being less than 150 metres from the ancient Giralda tower and the cathedral, whilst the Royal Alcazar palace, and the city centre are close by. There are two easily accessed carparks within a few minutes’ walk of the hotel. The charming Santa Cruz district and old town area is pedestrianized, although taxis can access the front entrance. This is a city hotel, so there is no need to rent a car; it is quickly reached by public transport and taxis from the airport or high speed AVE train station. As soon as you walk-in you are immersed in history. The elegant, gilt reception desk contrasts beautifully with the exposed brickwork of the walls, the stone floor and classic furniture. The greeting was warm and genuine. My guest registration card had been prepared in advance, so I just had to check the details and sign it. I had to show my passport, as is standard procedure in Spain. The front desk manager welcomed me and explained the breakfast times. My elegantly branded electronic room key cards were presented to me in a card together with the free Wi-Fi access code. I was taken personally to my room, a Deluxe on the roof terrace. Hotel Casa 1800 will open 9 new luxury suites this spring, bringing its total number of guest rooms to 33. There are five categories; standard, superior, deluxe, Junior Suite, and the exceptional, duplex Suite Grand Deluxe. 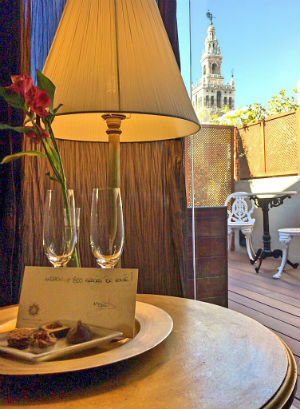 I stayed in a Deluxe room, on the roof level, so it had its own private roof terrace, with table, chairs, ‘jacuzzi’ and a view out across the rooftops to the cathedral and the Giralda tower; breath-taking. The King size bed (200cm wide) was a contemporary interpretation of a four poster. Made up with Egyptian cotton sheets, plenty of pillows, and dressed with 4 small silk cushions and a bed throw. To the right hung a crystal chandelier, together with a gilt mirror over a dressing table/writing desk where a kettle with tea and coffee were placed. The décor had a warm, luxurious feel, without being over-the-top. The simplicity of the new hard wood floors, exposed brickwork and timber celling contrasted well with the extravagance of the gilt furniture, soft furnishings and accessories. Against the blackout roller blinds hung contemporary textured silk curtains. The marble bathroom was compact, without a bathtub, but had a large shower with both an adjustable massage showerhead and tall rainforest showerhead. There were thick bathrobes, cotton slippers, tissues, hairdryer and a generous supply of bathroom amenities. Some rooms have bathtubs, so request one if that is important to you. There was also a digital safe and stocked mini-bar within the double wardrobe. The room was well lit with a choice of indirect lighting from lamps, the chandelier as well as ceiling halogens when you needed bright light. The room air conditioning (hot/cold options). There was a flat screen TV, but no sound system or iPod speaker. The outside private terrace was timber decked, screened with trellis and plants for privacy and had a ‘jacuzzi’ tub – perfect for a soak under the stars, enjoying the sight of the illuminated cathedral and tower. There was a table and chairs where breakfast can be served or ideal for enjoying a pre-dinner glass of cava. The welcome amenity included handmade chocolates and a hand written card, placed on the table with fresh flowers. The hotel is compact; the main common areas include the reception lobby with leather sofas, and soft velvet easy chairs; the internal patio with tables and chairs; the guest room terrace landings furnished with sofas; and the roof terrace with panoramic views of the city, furnished with tables, chairs and sun loungers. Quality is upscale, with plenty of attention to detail, but because this is an original mansion house in the heart of old town there isn’t the space for a pool or spa. Hotel Casa 1800 offers an informal buffet style breakfast served in-room, on your private terrace, or in the internal patio. The selection of hot and cold food includes Andalusian classics such as toasted breads with gourmet extra virgin olive oil and fresh tomato. Also fresh seasonal fruit, juices (expect the best Spanish orange juice! ), cold cuts including gourmet Spanish hams, local and national cheeses, as well as scrambled eggs, bacon and sausages. A selection of baked goods and cakes. There is a commercial ‘Nespresso’ machine for self-service espressos and lungo coffees as well as gourmet tea by ‘Revolution’. The hotel does not have a restaurant, but instead offers a complimentary afternoon tea, or ‘merienda’ as it is known in Spanish. Guests conjugate in the patio after a day exploring the city sharing stories and photos, whilst enjoying a selection of sandwiches, fruit, cakes and treats. There is also tea, coffee and a selection of juices, refreshments and bottled water. The team at Hotel Casa 1800 were in my experience very friendly and welcoming. Happy to help with directions, ideas for shopping, willing to arrange private walking tours, tapas tours and tickets to concerts. I felt at home at the hotel, and I enjoyed the room and terrace. It was more than just a luxurious base in the city, but a place in which I wanted to kick back and relax. Also, the location is flawless. For a city break enjoying the delights of Seville, this is the place to be, with the main sights on the doorstep. There is little need to take a taxi, bus or tram, as pretty much everything is within close walking distance, making a city break truly comfortable. It also means one can return to the hotel throughout the day to relax, change or get online with the free Wi-Fi. The hotel is compact, and unlike the larger properties on the edge of the city, it doesn’t offer a pool, spa or restaurant, but what it does offer in terms of accommodation and welcome is top notch. The hotel is more than happy to arrange appointments at day-spas, or a visit to the nearby ‘Aire de Sevilla’ Roman/Arab style baths – a luxurious modern, Mediterranean wellness spa experience. In addition, the front desk helps guests navigate the huge choice of Seville restaurants, bars and flamenco shows with ideas and suggestions and can also arrange private tapas tours, so one can enjoy the best flavours of the Andalusian capital. 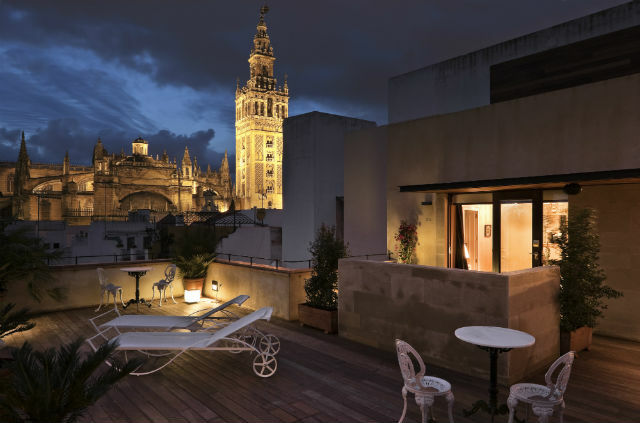 I have since returned to Seville and to the Hotel Casa 1800 to see the new extension and recently opened suites. 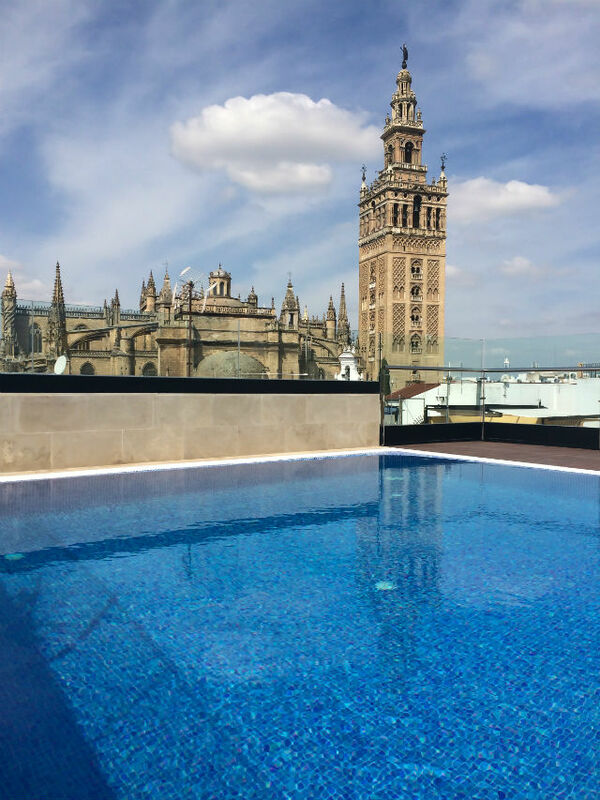 The first thing that is of note is that the sky terrace of the hotel now has a fabulous roof top swimming/plunge pool, with views across the city to the iconic Giralda tower; just perfect for those sultry summer Sevillano days. 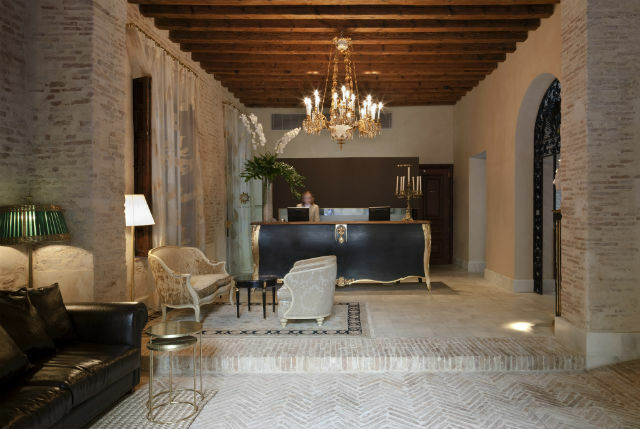 The new suites are in an adjacent period building that has been seamlessly integrated into the reception area of original Hotel Casa1800. The rooms are found around an additional internal patio and include Deluxe Rooms and Junior Suites with spa Jacuzzi tubs. 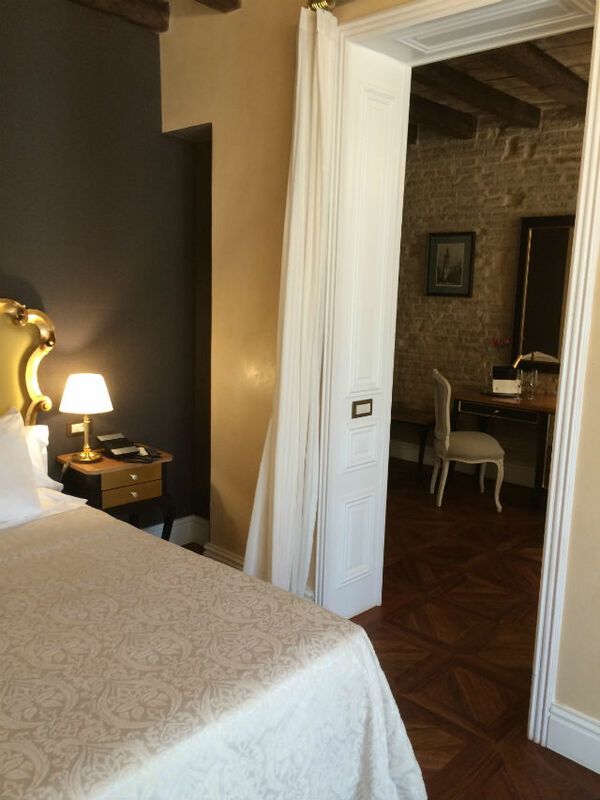 My suite had tall French style windows opening out onto cobbled streets of the Santa Cruz district. The suite was divided into two parts; a living area with TV, sofa, writing desk, console table and mini bar, and then the bedroom area with King bed, easy chair and an addition TV. The bathroom was spacious, with spa bath tub and also upgraded Molton Brown amenities and upgraded towels. The style is classic Casa 1800 with hardwood, gilt edged furniture, exposed beam ceiling and chandeliers. The colour palette is of muted earth tones. The floor in the suite was a wonderful intricate hardwood design, and the walls were a combination of characterful exposed brick and also a fine ‘tadelakt’ plaster finish. A selection of period prints added a warmth to the room. The bathroom door was ‘hidden’ within the fabric wallpaper of the entrance area of the room, creating an uncluttered elegant feel to the room. The breakfast and afternoon tea area has also been upgraded with a lighter, sleeker design. Rooms start from 165 euro per night, including breakfast and afternoon tea, in low season, but can rise to about 415 euro in high season. Yes, I would. Without a doubt, Hotel Casa 1800 offers an unbeatable location for a Seville city break with elegant guest rooms, with sumptuous touches. Be sure to book one of the new, additional 9 suites opening this spring for a truly luxurious stay in the capital.